Show Us Your Team Spirit! Fanatic football fans express their deep rooted love for their teams by wearing their team's colors all season long. 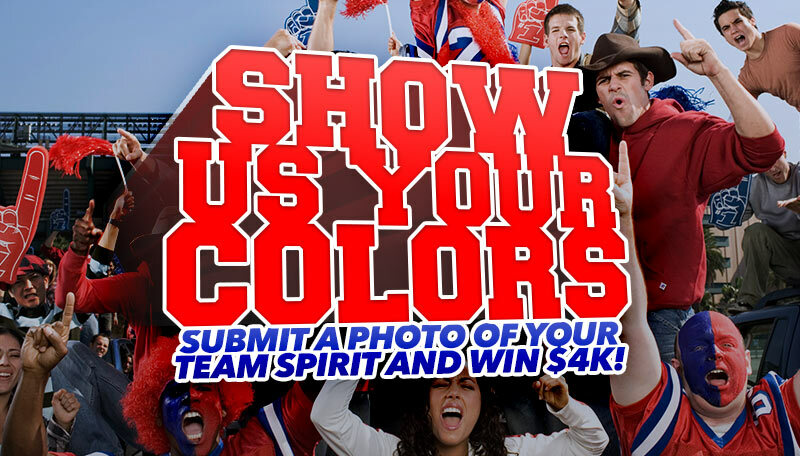 Whether through a team jersey or full body paint, we're giving you the chance to win $4,000 by uploading a photo supporting your team to our fan gallery! Make this football season $4,000 sweeter and enter today! The 99.5 the Wolf VIP (the "Service"), operated by Triton Loyalty, and KPLX-FM (together, Triton Loyalty and KPLX-FM are referred to as "we", "us" or "our") is provided to you ("you," "your" or "User") under the following terms and conditions, including any amendments thereto and any additional terms and conditions, rules or policies that may be applicable to particular offerings made in connection with the Service (collectively, the "Terms and Conditions"). We reserve the right to update or change these Terms and Conditions from time to time. Any such changes shall be reflected in an updated version of the Terms and Conditions posted on this site. By continuing to use the Service following the posting of any such change, you will be deemed to have agreed to the amended version of the Terms and Conditions. Any failure to comply with these Terms and Conditions by you may result in the termination of your account, and the forfeiture and relinquishment of all Points you have accrued in the Service. BY REGISTERING TO USE THE SERVICE, YOU AGREE TO BE BOUND BY THESE TERMS AND CONDITIONS, SO PLEASE READ THEM CAREFULLY. Unless otherwise specified in connection with particular offerings, participation in the Service is open only to natural persons who are 18 years of age or older. Employees or agents of KPLX-FM, Triton Loyalty, and each of their respective affiliates, and immediate family members of or persons domiciled with any such persons are not eligible to participate. In consideration of your use of the Service, you agree to provide true, accurate, current and complete information about yourself as prompted by the registration form and to maintain and promptly update your personal data to keep it true, accurate, current and complete. If you provide any information that is untrue, inaccurate, not current or incomplete, or if we or any of our service providers have reasonable grounds to suspect that such information is untrue, inaccurate, not current or incomplete, we have the right to suspend or terminate your account and to refuse any and all current or future use of the Service (or any portion thereof) by you. You may not register with a disposable email address. Only one member account per person and two member accounts per household. If you are 18 years of age or under you cannot post information about yourself on the website or complete the registration process. You can, among other things, review your accumulated Points, review the Terms and Conditions as amended from time to time, and review redemption options at 995thewolf.listenernetwork.com . KPLX-FM and Triton Loyalty (collectively, 'us', 'we', 'Operators') have created this privacy statement in order to demonstrate our firm commitment to privacy. The following discloses our information gathering and dissemination practices for the 99.5 the Wolf VIP website ('Site'). Eligibility. This Sweepstakes is open only to legal U.S. residents who are age 18 or older at the time of entry and who reside in the Designated Market Area (“DMA,” as defined by Nielsen Audio, who have not won a prize from the station in the last 90 days or a prize valued at $500 or more in the last 180 days, and whose immediate family members or household members have not won a prize from the station in the last 90 days or a prize valued at $500 or more in the last 180 days. . Void where prohibited by law. Employees of the Stations, Sponsor, its parent company, affiliates, subsidiaries, promotional sponsors, prize providers, advertising agencies, other radio stations serving a Station’s DMA, and the immediate family members and household members of such employees are not eligible to participate. The term “immediate family members” includes spouses, parents and step-parents, siblings and step-siblings, and children and stepchildren. The term “household members” refers to people who share the same residence at least three (3) months out of the year. The Sweepstakes is subject to all applicable federal, state and local laws and regulations. Participation constitutes entrant’s full and unconditional agreement to these Official Rules and Sponsor’s decisions, which are final and binding in all matters related to the Sweepstakes. Winning a prize is contingent upon fulfilling all requirements set forth herein. Sweepstakes Period. The Sweepstakes will begin at 12:01a.m., ET on September 4, 2017 and will run through 11:59 p.m., ET on September 24, 2017 (the “Sweepstakes Period”). Sponsor’s computer is the official time keeping device for this Sweepstakes. (i) Visit the website for the Station in your DMA and click on the “Contest” link, (ii) click on the “Football Photo Contest: Show Us Your Colors 2017” link, and (iii) complete an entry form (each an “Entry Form”), which will also include uploading an original photo. All entries must be received by 11:59 p.m., ET on September 24, 2017. Limit one (1) Entry Form per person per day per email address during the Sweepstakes Period. Multiple participants are not permitted to share the same email address. Any attempt by any participant to submit more than one (1) Entry Form by using multiple/different email addresses, identities, registrations and logins, or any other methods will void that participant may be disqualified. Use of any automated system to participate is prohibited and will result in disqualification. Sponsor is not responsible for lost, late, incomplete, invalid, unintelligible, inappropriate or misdirected registrations, all of which will be disqualified. In the event of a dispute as to any registration, the authorized account holder of the email address used to register will be deemed to be the participant. The “authorized account holder” is the natural person assigned an email address by an Internet access provider, online service provider or other organization responsible for assigning email addresses for the domain associated with the submitted address. Potential winner may be required to show proof of being the authorized account holder. All entries become the sole and exclusive property of Sponsor and will not be returned. Sponsor reserves the right to contact entrants and all other individuals whose email address is submitted as part of this promotion. No mail-in entries will be accepted. Entry photos that are indecent, lewd, offensive, defamatory, contain profanities, or are in any way in bad taste or contain material(s) which may infringe upon any person or entities proprietary rights, as determined in the sole discretion of the Station, will be disqualified. Winner Selections. On September 25, 2017, Sponsor will select one (1) Entry Form for the Grand Prize described below in a random drawing of all valid Entry Forms received from all Stations during the Sweepstakes Period. All winning entrants will be contacted using the email address and/or telephone number provided with the Entry Form and may be awarded the prize (subject to verification of eligibility and compliance with the terms of these rules). Sponsor’s decisions as to the administration and operation of the Sweepstakes and the selection of the potential winners are final and binding in all matters related to the Sweepstakes. Failure to respond to the initial verification contact within 24 hours of notification will result in disqualification. Entry Conditions and Release. By entering, each participant agrees to: (a) comply with and be bound by these Official Rules and the decisions of the Sponsor, which are binding and final in all matters relating to this Sweepstakes; (b) release and hold harmless the Sponsor, Cumulus Media Inc., subsidiaries, and affiliated companies, participating sponsors, the prize suppliers and any other organizations responsible for sponsoring, fulfilling, administering, advertising or promoting the Sweepstakes, and each of their respective past and present officers, directors, employees, agents and representatives (collectively, the “Released Parties”) from and against any and all claims, expenses, and liability, including but not limited to negligence and damages of any kind to persons and property, including but not limited to invasion of privacy (under appropriation, intrusion, public disclosure of private facts, false light in the public eye or other legal theory), defamation, slander, libel, violation of right of publicity, infringement of trademark, copyright or other intellectual property rights, property damage, or death or personal injury arising out of or relating to a participant’s entry, creation of an entry or submission of an entry, participation in the Sweepstakes, acceptance or use or misuse of prize (including any travel or activity related thereto) and/or the broadcast, exploitation or use of entry; (c) I am the true and rightful owner of the Photograph and I have the full right and authority to enter this Contest in favor of the Released Parties; (d) If a child is included in the photograph, I am the Legal Guardian of the child whose image is portrayed in the photograph and/or have permission from the Legal Guardian to submit the image of the child (e) I, by entering this Contest, agree to give to the Released Parties and its licensees, successors, and assigns a non-exclusive, worldwide and perpetual license to use, re-use, broadcast, and publish the Photograph, as well as my name, biographical and other information in whole or in part, as part of a composite, retouched or distorted in character or form the Photograph, for any reason that the Released Parties deem necessary without compensation, including for advertising, promotional, and related purposes in connection with the activities or promotion of the Contest, unless prohibited by law. I agree to release, discharge, and hold the Released Parties harmless from any and all claims I may have against the Released Parties in connection with the use of the Photograph my name, and/or city of residence, in whole or in part, as part of a composite, retouched, or distorted in character or form and without restrictions as to any changes, transformations or alterations and (f) indemnify, defend and hold harmless the Released Parties from and against any and all claims, expenses, and liabilities (including reasonable attorneys’ fees) arising out of or relating to an entrant’s participation in the Sweepstakes and/or entrant’s acceptance, use, non-use or misuse of the prize. SWEEPSTAKES SPONSOR: CUMULUS MEDIA HOLDINGS INC., 3280 Peachtree Road, NW, Suite 2300, Atlanta, GA 30305, Attn: “Football Photo Contest: Show Us Your Colors 2017” Sweepstakes.